David Ginola thinks Manchester Utd forward Anthony Martial may leave Old Trafford after being left out of the France World Cup 2018 squad, according to the Evening Standard. France manager Didier Deschamps named his squad yesterday and it was bad news for Alexandre Lacazette and Martial with the Arsenal and Manchester Utd stars being left out, according to Sky Sports. Lacazette and Martial have been included on the standby list, but ex-Tottenham star Ginola, feels that a lack of game time in the Man Utd first-team has played a huge role in him being omitted from the squad. “The main reason Anthony Martial is not in the squad is that you need to be a regular in your club before becoming a regular in your national team,” former France international Ginola told Press Association Sport, as per the Evening Standard. 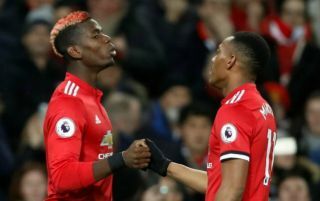 Martial has often been left out of the starting XI by Utd manager Jose Mourinho this season and despite this, Ginola feels Utd is still a good fit for the young French star. However, Ginola has advised him to prove his worth to Mourinho by giving more in training and in games. “Players like Martial need to play and score goals for the confidence, they need to be a regular. If he is not a regular at Manchester United he will probably search for another club and find one if he wants to,” Ginola said, according to the Evening Standard. “But I think Manchester United is a great club for him and it’s up to him to give more in training and in games. According to the Daily Mail, Martial has been linked with a move to Chelsea in the summer with the west London club said to be drawing up a list of names for Antonio Conte’s successor, should he leave Stamford Bridge. Martial could be the perfect replacement for Eden Hazard if he leaves the club this summer, with The Sun linking the Belgium with an incredible £100m move to Manchester City.